I have talked about this before, but it keeps coming up, so here it is again! EXCUSES!!! I am so often asked what I did to get rid of my back pain after my 3 back surgeries. My answer to that is I DIDN’T! Pure and simple, I hurt EVERY DAY! I have a low lumbar to sacral spine fusion, along with degenerative disk disease. arthritis, mild RA, an old shoulder injury, and my right ankle is goofy, because since I was a 12# breech baby, they had to break it when I was born, and as a result, I am missing some cartilage. So WHY do I do all that I do? Because I can either hurt AND be unhealthy and do NOTHING with my life to ever make it better. OR….I can do my best and try to inspire and motivate others to look past their excuses and do something! Excuses will get you nowhere! The excuses I used 10 years ago(my back, my weight, my aches, and on and on) were DUMB! I did not realize that I would actually hurt so much less than I did while being 140# overweight! And to ditch diabetes, high BP, and high cholesterol all at the same time? NO excuse is big enough to justify not getting healthy and keeping from having to take hundreds of dollars in medications each month just to mask symptoms! Meds don’t HEAL, they mask! So sure, I sometimes do take an acetominphen or naproxen sodium for my pain, but it is MUCH better than the handfuls of narcotics I used to take DAILY! Not to mention the large amount of booze I used to consume daily just to dull the pain. And I KEEP MOVING! Modify is my middle name! I simply don’t move the same way other people do! I do MY best! But I do NOT use back pain that I am going to have whether I am lying on a couch or walking or doing Zumba or doing a Beachbody DVD program or jogging. The pain is there! It is not going anywhere. But I will not let it be the excuse that keeps me from living my life! I have dreams that can’t be accomplished from a couch! 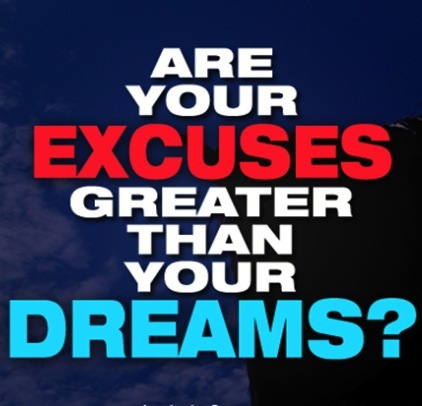 My dreams are BIGGER than my excuses! And my biggest dream is to help others win the battle against their excuses and get to living their life in a way that serves THEIR DREAMS! This really resonated with me today after last night’s killer FIT class. I understand what you are saying. People see me limping around and assume it is because I exercised. They ask me why I do this to myself. I explain that I hurt whether I go to class or not. It is not a choice between pain or no pain; it is a choice between pain/stiffness from sitting still or pain/soreness from movement. It is up to me to choose which one I will endure. Yes, the pain is real, and yes it hurts! But with pain and soreness from movement I have the hope of a better tomorrow through improved fitness. I am also in a better mood and feel great accomplishment from doing things that are difficult. There are times that I modify, and there are times that my body tells me to sit out and rest, but most often it is productive and necessary to keep moving. You are an inspiration and a wealth of information and encouragement. Keep telling it like it is!